Sunlight that comes into your home uncontrolled can fade carpets, drapes and furniture. Heat from sun can cause damage to electronics and digital equipment and cause wood on floors and furniture to warp. Window treatments keep the house cooler on hot days and can save money and energy by cutting down on heat and sun damage. One of the first things you can do is have your windows tinted. Also known as solar window film, this is a great solution to eliminate UV rays and reduce heat. This is a permanent solution because these films have a lifetime warranty, block 99% of the ultraviolet light and absorb up to 70% of incoming solar heat. Solar shades are another great solution. They can be used both inside and outside the house. The interior shades filter the UV rays during bright summer days, while maintaining the perfect temperature indoors. The outdoor shades provide maximum protection from the sun’s heat and glare. They come in many different styles such as simple roller shades, Roman folds and contemporary designs — which look good with any décor. 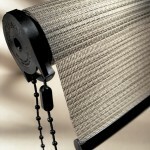 You can have them installed as manual or motorized shades. For more privacy, you might consider honeycomb shades that are made for energy efficiency. They come in sheer to room-darkening styles and in many different colors. These, too, are sold either motorized or manual. The federal government is giving a 30-percent tax credit — up to $1,500 — on all of these energy-saving treatments.